Cringe alert – grin or grimace? I always thought the Amber alert concept was a good idea – getting children back that have gone “missing” asap. Who wouldn’t? Children are our most vulnerable citizens, but sadly it’s usually an abusive relative that does all the harm instead of all the care. 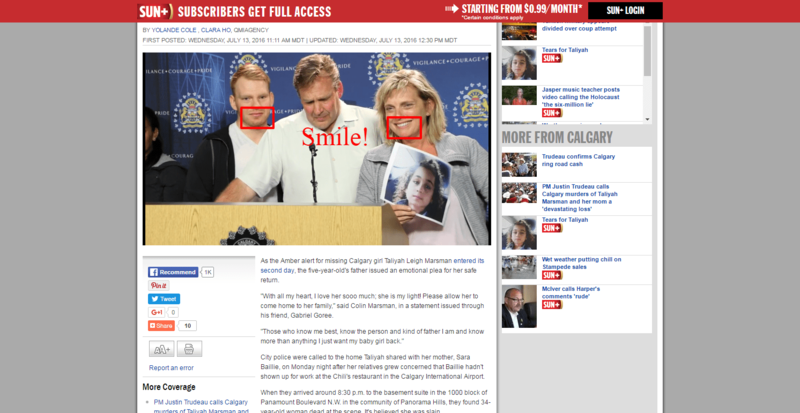 That said, if this case isn’t a hoax, then it’s the most un-heartfelt press conference I’ve seen in a long time. Not a tear in sight. In fact, smiles usually replace grimaces, since they take less effort to fake. This bit of fakery falls into the category of noble lie, that is, promoting a good idea with a typical case using crisis actors. Noble lies are controlled fake events conducted in typical #HRDPAR fashion: they look every bit real, use many regular (unaware – is it possible?) EMT personnel, but the prime agents are actors and agents. As the Amber alert for missing Calgary girl Taliyah Leigh Marsman entered its second day, the five-year-old’s father issued an emotional plea for her safe return. “With all my heart, I love her sooo much; she is my light! Please allow her to come home to her family,” said Colin Marsman, in a statement issued through his friend, Gabriel Goree. Maybe this company can help sort out if what we’re seeing is genuine. This entry was posted in Noble Lie on July 14, 2016 by ab.